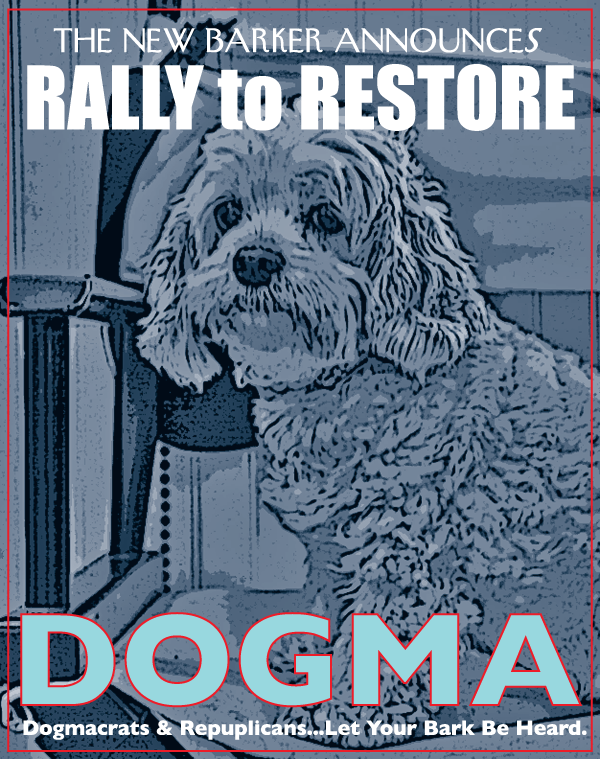 The Rally to Restore Dogma. All tongue-and-cheek aside, seriously, today is an important day in America. Thankfully, whatever the outcome, life goes on with our dogs. Friday, November 5 visit Taste Cafe in Safety Harbor for the unveiling of the Humane Society of Pinellas County’s 2011 Calendar. The suspense is finally over. Who made the calendar’s cover? Taste Cafe is located at 500 Main Street, Safety Harbor. On Saturday, November 6 it’s the 4th Annual Wag-A-Palooza at Plaza Bella on Bloomingdale Avenue in Valrico. Hosted by the Merchants of Plaza Bella, the free event will feature rescue groups and their adoptables, valuable savings for holiday shopping and delicious food samplings. For more information, contact Debbie at 813.681.8686. Also on Saturday, November 6, it’s Dox-A-Palooza, the annual fundraising event hosted by DARE, Dachshund Adoption, Rescue and Education. The event takes place at the Mango/Seffner Dog Park, 11717 Clay Pit Road in Seffner. There will be a silent and live auction, rummage sale, dog costume contest and plenty of raffle prizes. And of course, what would a Dachshund event be without the famous Wiener Races? Gaspar’s Grotto is located at 1905 East 7th Avenue in Ybor City. Call 813.248.5900 for new Pets on the Patio hours. If your holiday plans include bringing a new dog or cat into your home, consider adopting. Another consideration: think about adopting before the rush of the holidays is upon us in an effort to calmly introduce your new pet into his or her environment. While the thought of presenting a new puppy wrapped in a shiny red ribbon is tempting, oftentimes the excitement during the immediate holidays is too much stimulation for a new pet. And for humans too, especially children. Fortunately, we have a couple of early adoption options for consideration. On November 13 TampaPets.org, in conjunction with the Humane Society of Tampa Bay and Hillsborough County Animal Services, will be hosting its sixth Adoption Expo at the Florida State Fairgrounds. Through this unique partnership and with the help of the ASPCA, the event continues to remain free to all participating rescue groups and to the public. Another bonus for the Fall Adoption Expo – the parking is free. Visit http://www.tampapets.org/expo.php for more information. This is an all-round great experience for the entire family. 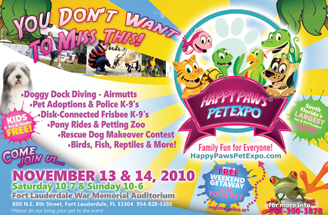 The Happy Paws Pet Expo takes place on Saturday and Sunday, November 13 and 14 at the Fort Lauderdale War Memorial Auditorium. This event has been in the works for almost a year and will be one of the best bets for a two-day event. Families are encouraged to bring their dogs as this is an interactive event, complete with competitions in agility, flyball and more. Entertainment from media personalities and some amazing performing animals as well. And of course, rescue groups will be on hand with their adoptables ready to take home. Also on Saturday, November 13, Pug Rescue of Florida is gathering Pug lovers from across the state to the largest Pug Meet-up of all time. PugsGiving will be held at the Maitland Civic Center. And speaking of Pugs, one of Florida’s biggest Pug lovers, the incomparable Robert Plunket, will be emceeing Hot Dogs and Cool Cats at Michael’s on East in Sarasota. Mr. Plunket has scripted a murder mystery to outshine all others. It’s all in fun and all to benefit the Humane Society of Sarasota County (HSSC). For ticket information, call HSSC at 941.955.4131. Author Anna CookePosted on November 2, 2010 Categories Uncategorized2 Comments on The Rally to Restore Dogma.